Last year, I wrote several posts on the blog about preparing for standardized testing. You can find them here, here, and here. Did your blood pressure rise when you read the words “standardized testing”? 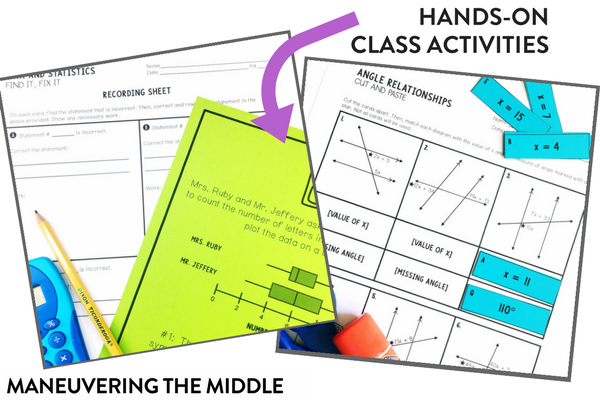 This year, I wanted to give you a peek inside my middle school math test prep unit and ideas for how you can implement this resource in your classroom. 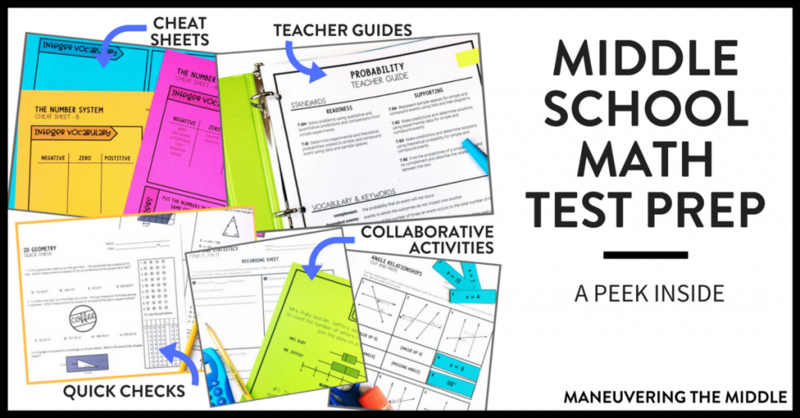 Hopefully, these components will help streamline your test prep for state assessments and keep students engaged at the same time. FYI – in my classroom, my goal was to be able to pull small groups during review. Sometimes that looked like working with a group while we were doing activities. Sometimes it looked like working whiteboard problems as a small group, while other students were using the quick checks. I would encourage you to use this time to clear any misconceptions and to target key skills. When looking at our review and test prep resources, it’s important to keep in mind that there are more resources than you will likely be able to use. It was designed this way so that you can pick and choose what is best for your students! Keep in mind that your advanced classes might be fine focusing on the activities and keeping the cheat sheets as a reference. On the other hand, your bubble classes might benefit from the cheat sheets and reviewing the concepts before the activities. For that reason, included you will find instructions for use, implementation ideas, four sample schedules, and blank pacing guides for your reference. I know that I really liked reviewing the more difficult concepts upfront and saving the easier concepts for closer to the test. 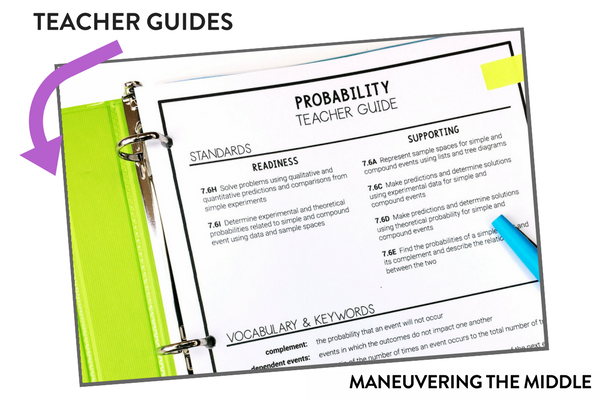 The quick teacher guide hits the standards included, overviews the vocabulary, and gives you a few tips for misconceptions your students might have. These are super helpful for co-teachers, any tutors your campus might be utilizing, and any time you are enlisting the help of other teachers. Blow them up on your poster maker at school and hang them for a reference. Print and laminate a class set. Send them home when parents ask for materials. Set the timer for four minutes and have students jot down everything they recall about the concepts, and then discuss as a class. 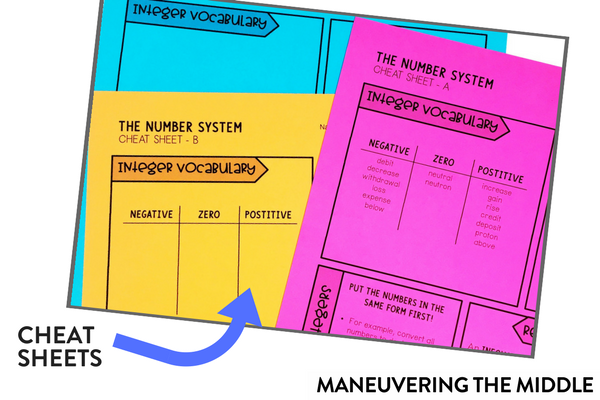 DOWNLOAD A FREE CHEAT SHEET FOR 6th, 7th, and 8th grade here! 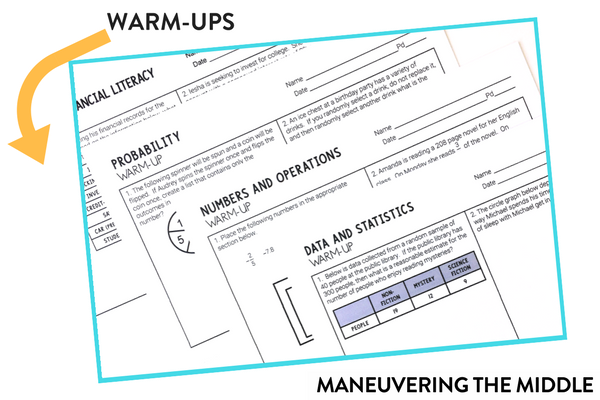 I am a firm believer in a warm-up, so it would be impossible to not include them! These are open-ended questions that are aligned to the content for the day. If you don’t have time for a warm-up, then you could use them as an exit ticket or as a quick assessment. You have an abundance of activities to choose from and utilize within your classroom. 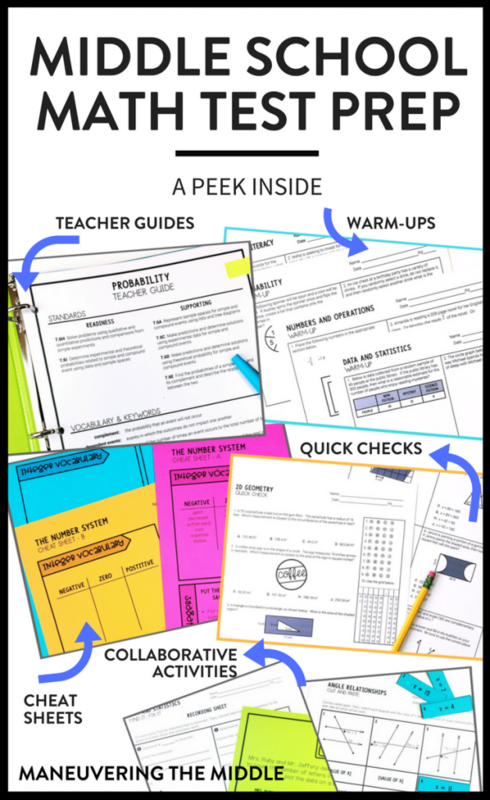 For the most part, the activities require only card stock and some lamination, if you choose, so the prep is quick and easy, and the engagement is high! Lastly, the quick checks have been written to address the depth and complexity of the standard. The answer choices have been carefully selected so that students really have to use their brains and prove what they know. 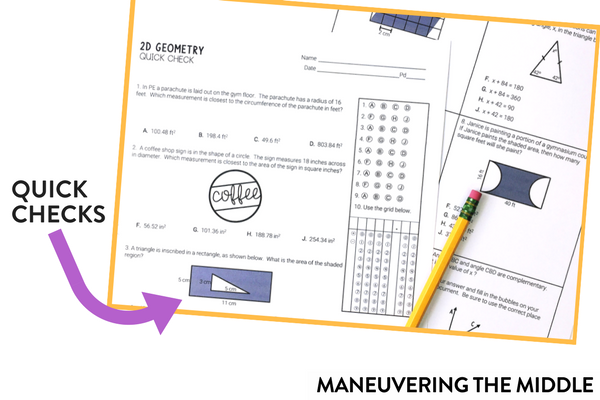 Each quick check includes one open-ended response and most include a griddable answer box for students to practice with. It has always been my opinion that not only do we need to teach the standards, but we also have to teach problem solving and endurance, as many assessments require hours of concentration and focus. Now while the term “test prep” still might incite a spike in your blood pressure, hopefully you feel a sense of relief when you notice this has all been done for you. Grab the resources here and save yourself hundreds of hours of prep. IT SAID I WAS SIGNED UP, BUT WHEN i CHECKED MY EMAIL I HAD GOTTEN NEITHER OF THE POSTS I REQUESTED. DID I DO SOMETHING WRONG OR AM I BEING IMPATIENT? Sorry, not yelling. Didn’t notice Caps was on. Could you try again using your personal email? Typically, work/school emails are heavily filtered. Your site is so helpful! I’ve gotten a lot of good ideas as I searched through it today. This will be my sixth year teaching, but my first teaching 6th grade math. Up until now, I have taught third and fifth grade. Thank you for all of your insight. I’m excited to get started! I am so happy we could help! You are going to do great! Best of luck!